On August 4, 2018, I attended the Student Banquet and Fashion show at Stitches Midwest in Schaumburg, IL. The Student Banquet is probably my absolute favorite event to attend, because the pride of creation is on every face who shows off their work on the runway. This has been my 7th time attending the Student Banquet, and so far, it has been my favorite one. It’s my favorite for one reason – CROCHET! 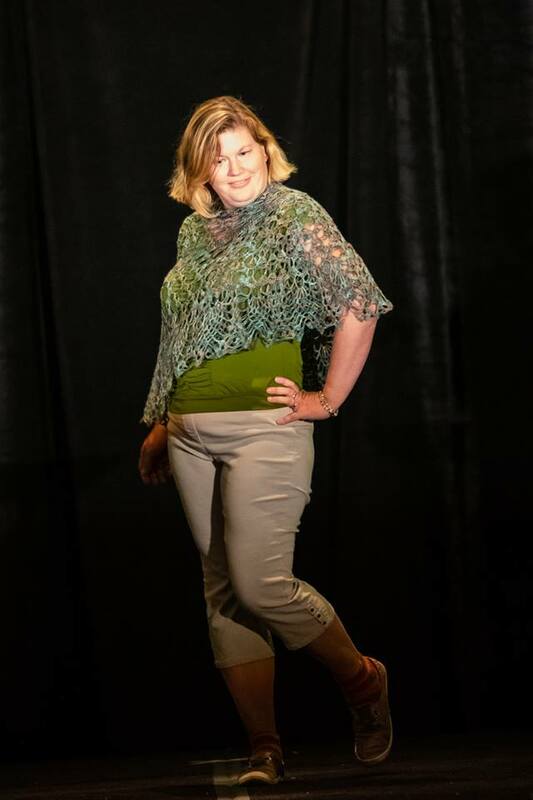 Not only were the first FOUR garments crocheted, but there were 11 crocheted pieces total. Also making a show on the runway this year – sewn and quilted pieces. Stitches just isn’t for knitters anymore! One of the items that came down the runway has a very special meaning to me. 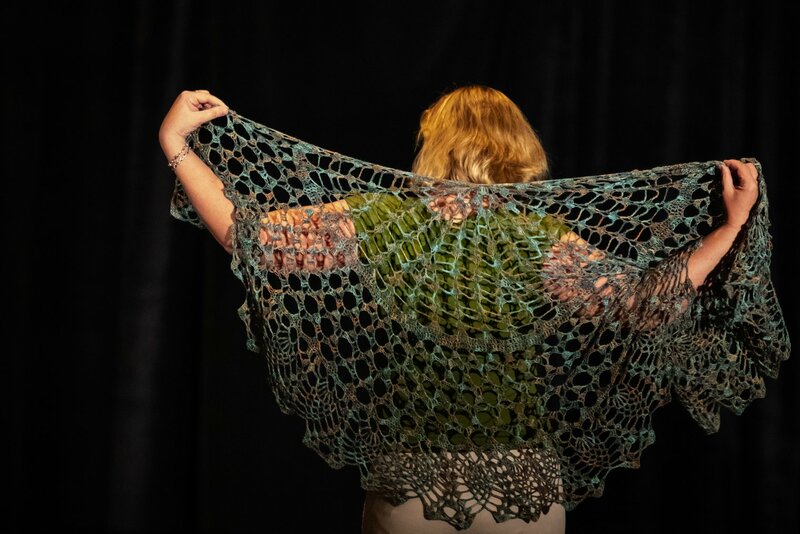 My younger sister Kate, whom I taught to crochet when she was pregnant, modeled a lace shawl stitched from a pattern I released in March 2016 to celebrate being part of Internation Crochet Month. 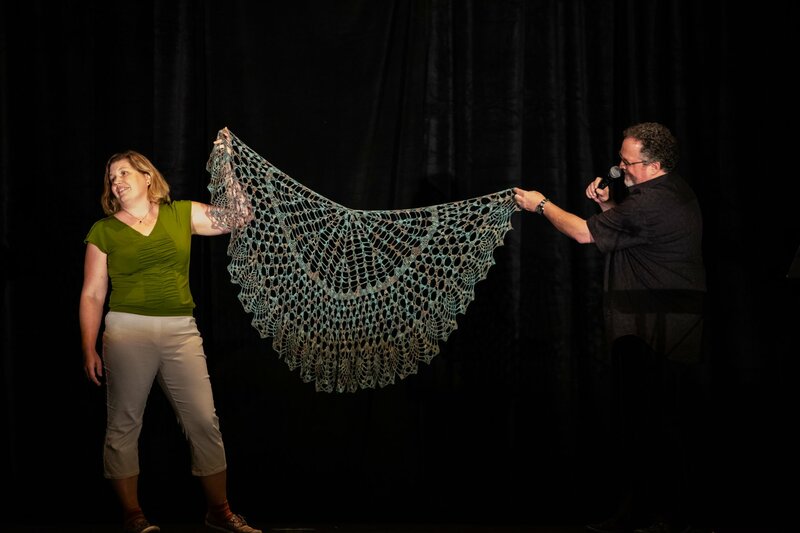 The pattern is the Terra Shawl [https://www.ravelry.com/patterns/library/terra-shawl] and it is special to me for being the first half circle shawl I designed, as well as helping to design the yarn colorway for the pattern. It was the first time I saw something I designed and published myself being worn on the runway by someone other than myself, and it brought tears of joy to my eyes. 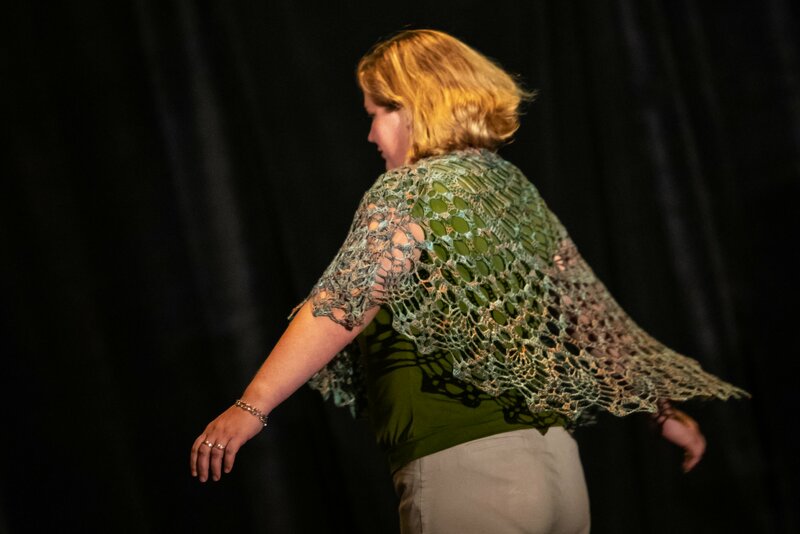 So forgive my indulgence, but here are several pictures of Kate, modeling the Terra Shawl. Thank you to XRX, Inc. for making these pictures available to share.